a converted petrol tanker based at Ellesmere Port near the huge Stanlow oil refinery but photographed here in the mid 1970s in Chester City centre. Cheshire have always had major foam resources because of the presence of the petrochemical industry in the Mersey basin. Thanks Petros for taking the time and trouble to send in an impressive collection of pictures and also for the information supplied with them. Added by Chris Wood on 10 November 2009. I think this one was a converted brewery tanker rather than a converted petrol tanker. It was a rather ungainly beast. Added by Ian Moore on 19 October 2010. Added by Sean Griffiths on 19 October 2010. Fine - I'll stand corrected and gladly apologise. It was the brigade themselves that told me it came from Whitbread's Brewery. It actually came from Yates' Haulage and is an ERF 'A'series 68GX. 6 Cylinder, 8 wheels, Gardner engine. Added by Andrew Middleton on 19 October 2010. The previous owners were Guinness Mansley and Yeats Haulage of Liverpool.Possibly the confusion with a brewery deriving from the first name of the company. Some celebrity being attached to the company as I beleive the Yeates was in fact former Liverpool football captain Ron Yeates! Added by Tony Jones on 30 October 2012. Does anyone know where this is now? I presume it has not survived. Ungainly perhaps but beautiful for sure. Added by Monkey Boy on 31 October 2012. Monkey Boy your right the rear body work has been well built following the curve of the Tank ....no easy task many of this type simply had boxes bolted onto spare space on the chassis ....some one took the time to design a functional but carefuly built storage set up for this unit. Added by Gary bolton on 01 November 2012. I believe this vehicle has survived but now carries a flat platform body.Can't confirm as I've not seen it. Added by Tony Jones on 23 November 2012. Pics on CCMV site of it with fridgebox on, Crewe Cold Food Store, G Plant. Looks good too. Added by Gary Simpson on 24 November 2012. It did belong to GMY based in West Derby village Liverpool and was at one time driven by my father, thats when GMY could afford the fuel and were not being chased by the sheriff of Chester. Added by David Chamberlain on 22 December 2013. This vehicle is know owned by Philip Plant from Crewe, and has a Gray & Adams fridge box on it. Added by Philip.pdptransport@yahoo.co.uk on 03 November 2017. 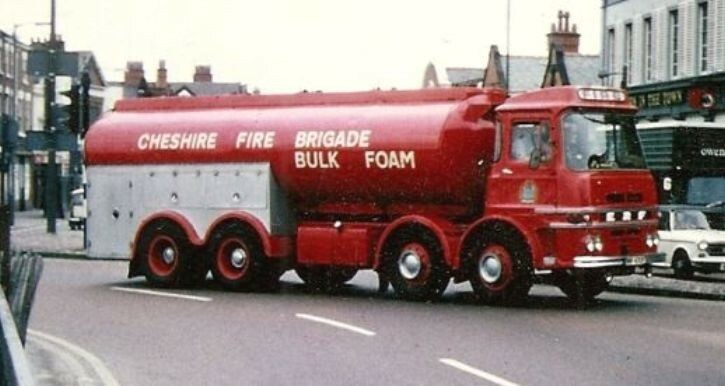 I drove one of GMY's tankers in the 70s. They were old, terrible to drive and basically unroadworthy. I encountered a snow storm in Buxton and when I turned on the wiper it was just 6" long having been cannibalised from a small car. I abandoned it plus load and hitchhiked home. Prior to this I'd been driving it in Cumbria and when I turned the lights on they were only a dim glow. I had to wait for a vehicle to approach then go as fast as I could behind it till it disappeared then park and wait. Never got paid either. Added by Terry on 06 April 2019. Further to my comments above, GMY operated from a garage in West Derby Village and we collected the load from Stanlow. The tankers were all painted red and a magnet for Vehicle Testers because they were in such a bad condition. In fact one of them coming off the Queens Drive flyover at Sleepers Hill buried itself into the front of a house. Fortunately no one was badly hurt. Added by Terry on 09 April 2019.